Every once in a while we see a patient who is simply hard to work with. Notice I said “patient,” as opposed to “client.” While we do sometimes see people (clients) who are difficult, it’s pretty rare. Between dogs and cats it is more common to see a hard-to-handle cat than a dog, simply because they are small, fast, have incredibly sharp nails and teeth like razors. Unless we are unable to muzzle a bad dog we can usually handle them, as teeth are a dog’s best weapon. Siminie is a beautiful cat, but can be difficult to handle. Siminie is one of those cats. He has a long history of “being difficult,” and, despite reaching age 16, he is still quite fast. I have a brand new scratch on my left index finger to prove it. 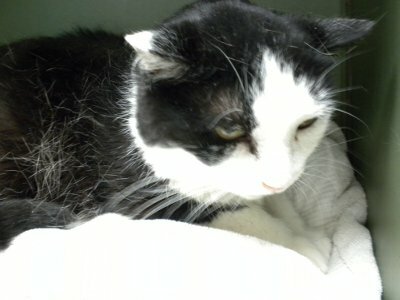 Siminie arrived at our hospital today with a complaint of hard swallowing, sneezing and a bloody nasal discharge. Obtaining his history is one thing. Performing a worthwhile physical examination is altogether a different matter. We were faced with a dilemma: anesthetize the elderly kitty without the benefit of preanesthesia laboratory tests, for the purpose of obtaining laboratory specimens and evaluating the oral cavity and throat. Or, treat Siminie symptomatically and hope he gets better, but reserving the option to go for a diagnosis if he doesn’t respond. After discussing the alternatives with the owner, she elected the latter, so we went with a “working diagnosis,” also known as a “tentative diagnosis.” These are terms we use when we don’t know exactly what is wrong with a patient and we are either awaiting laboratory tests or planning to perform more diagnostics later. Our working diagnosis for Siminie is upper respiratory tract infection, and we have begun treatment with a Convenia injection. Having discussed the options with the owner, we will see how he responds over the next few days.